Most of you surely wonder what on Earth this beautiful piece of architecture is doing here, and why it is left is such a state of decay? That’s quite a story, so bear with me and I will try to answer some of these questions to the best of my knowledge (and mostly thanks to the Heritage Portal, by the way). 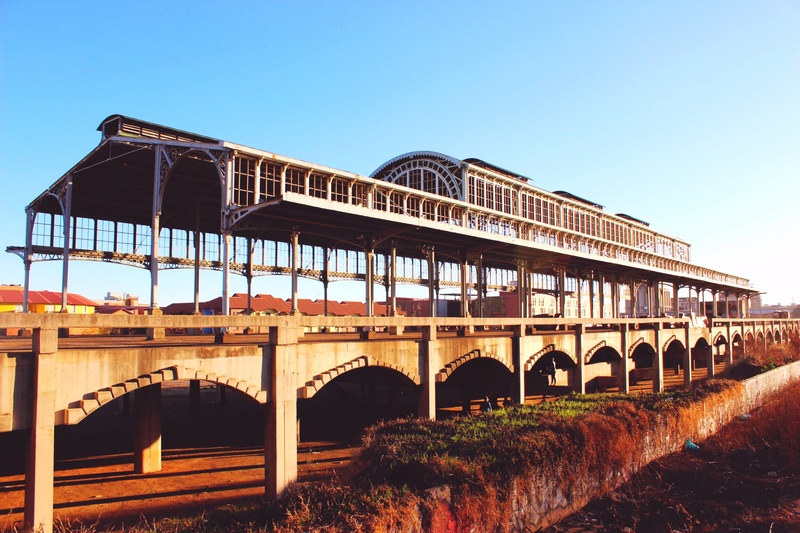 The station was commissioned in 1894 by the ZAR government to the Dutch architect Jacob Klinkhamer (1854-1928), a civil engineer specialised in semi-industrial buildings. Jozi had been funded 8 years ago, and was going through rapid changes in the heat of the gold rush. Migrants were arriving by hundreds everyday, and the mines desperately needed coal and heavy material to operate. The development of a proper railway system was a necessity, and it was decided that the city would be equipped with a station at the size of its ambitions. Yes, but in a young city like this, full of miners and landlords, where to find the architect to design such a beauty? Not to worry. The ties with the old Dutch Empire were still strong: they had the man, the skills and the foundry. They would provide the station. But let’s go back to the early years of the station: it was forged in the Hague (the seal “Pletterij den haag” can still be seen on its columns today) and shipped to Jo’burg, where it was to start its magnificent destiny. That was without counting on the numerous misfortunes of the monument: from the original structure designed by Klinkhamer, only the main platform, its roof and a few buildings were erected (1896-1897). 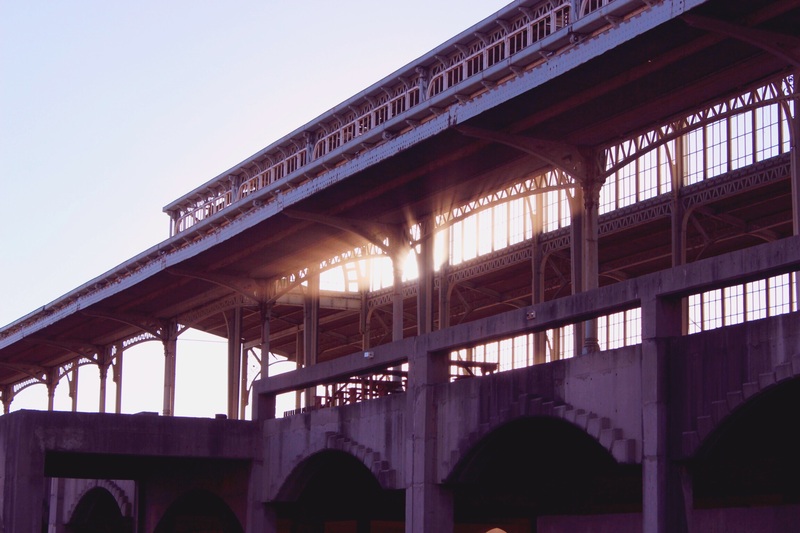 Forget about the large main building (1200 square meters) that was part of the original plan, housing the concourse, the customs, the ticket offices, and other facilities. The anglo-boer war was about to start. There were other priorities than to fund such a magnificent piece of architecture. 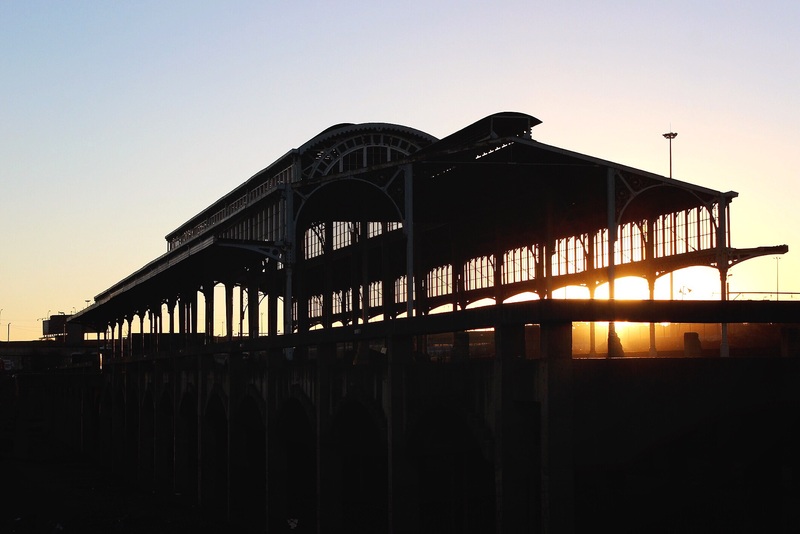 From the moment it was erected, the 154-meters steel canopy was used as Johannesburg main station for more than 50 years, completed by adjacent buildings as the inflow of migrants and visitors kept growing. 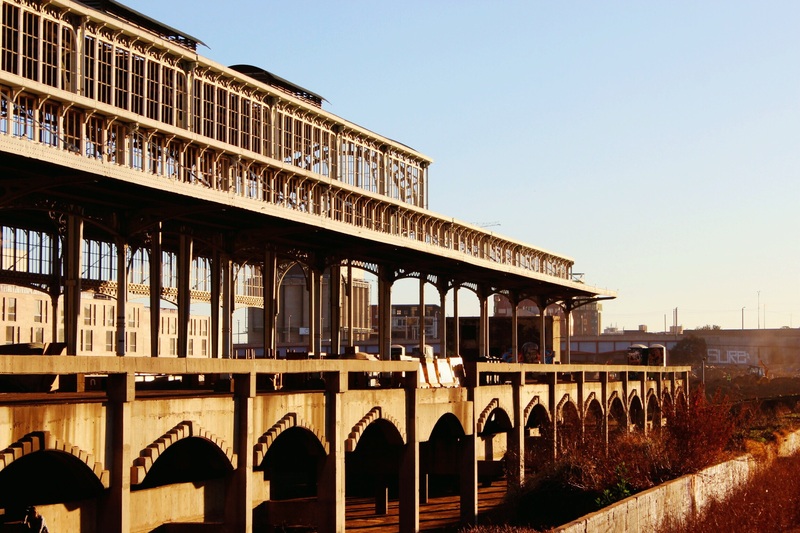 It is only in 1952, when a new station was built, that the iron structure was dismantled. Some say it was sent to Pretoria, but most likely it was moved to Kempton Park where it was used as training center for railway personnel. Anyway, during 40 years, the structure was out-of-sight, and people had long forgotten about the gracious Neo-Dutch Renaissance building when it was suddenly resurrected, in 1995, in its new location. What are the reasons that led to bringing back the canopy? Again, not fully clear. Plans were made to erect a Railway Museum on this new location. Any concrete action in that direction is yet to be seen, although the project seems to be tentatively revived from time to time. In the meantime, it has been used by truck drivers to practice their reversing skills. In October 2014, a new market was planned to be launched on this site. Again, fate had it that the market would rapidly shut down, and is now planned to reopen in September 2015. What is sure is that the building was at some point used for illegal rave parties, and now hosts celebrations like weddings or Halloween parties, when it is not used to shot neo-gothic videoclips like the one below (according to the Gauteng Film Commission… I had personally a hard time recognizing the station…). Well, no matter what its use is, there’s one thing for sure: Jo’burgers still have at heart their old station, and find in its multiple reinventions an echo to the history of their city. Let’s now hope that the dark days are over, and that the station can rise again to enjoy the bright future it deserves. Sentench Tower overlooking the station… Surely one of the next landmarks’ post! 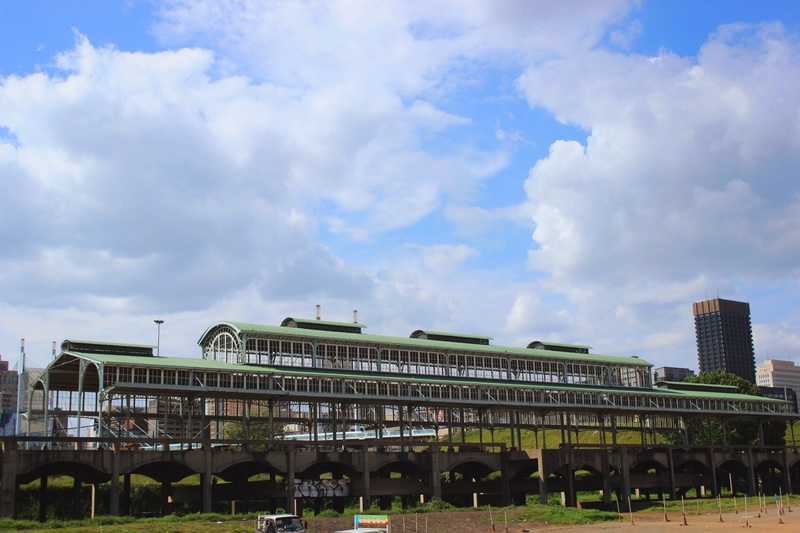 For more information on the station, you can read this greatly detailed article from the Heritage Portal. And click here for information on the coming market. I’ve been wondering what that place is..and now I know. Thanks! Do you perhaps know who owns this magnificent place? It’s so picturesque… would love to use it for a fashion shoot. Any help in this regard would awesome. Thanks! Hi Dieg! Ufff, that’s a hard one. You can try to contact the company who wanted to start a market there, they might know who the owner is. Otherwise, try to contact the Heritage Portal. They are usually very well informed. And good luck with the show! Forgot to mention: the link to the market page is in the post!